Robert S. Wilson, author of Shining in Crimson and The Quiet: News, news, news, news for the public! News, news, news, news for the public! If you're on Facebook you should head over to the Countdown to Fading in Darkness event and join up. 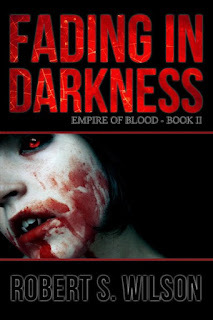 I'll have five days of games, trivia, giveaways, free ebooks, and sneak peeks at Fading in Darkness: Empire of Blood Book Two starting on April 19th through the release date of the book on April 23rd! And if you're not on Facebook, perhaps I'll bring a little bit of the party over here. If you'd like me to do that, comment and tell me. That will probably give me more motivation. 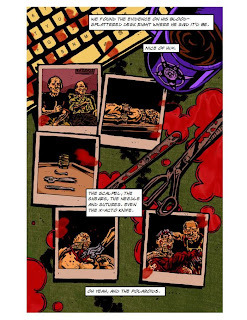 And don't forget that the book is currently available for pre-order purchase right here on my site through Paypal in all ebook formats, trade paperback, and limited edition hardcover. I know most people like to buy their books on Amazon these days, I'm the same way, but when you purchase directly from an author chances are they'll get a bigger cut per book even with using a service like Paypal. 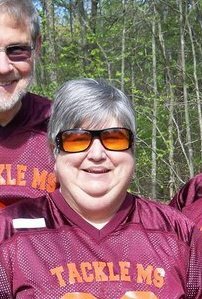 In other news, my family and I will be doing the MS Walk again this year and we would be very appreciative if any of you kind souls out there would like to donate to the Wilson family MS Walk Team to help fight Multiple Sclerosis. For those of you who don't already know, last year we lost my mother in law after a 30+ year battle with MS, so it would mean a lot to us if you could make a donation however big or small. of the Empire of Blood series, this will be a really cool item to have.